Part 1 of a three-part series on the U.S. Mint’s 2016 Centennial Gold Coin program. Last year the U.S. Mint proposed issuing solid gold versions of the three Liberty-themed silver coins that debuted in 1916: the Winged Liberty dime, Standing Liberty quarter, and Liberty Walking half dollar. This program smartly capitalizes on the long-standing nostalgia of collectors for these iconic and classic coins. Collectors have been eager to find out more about the coins ever since they were proposed, such as whether they will have a specified mintage level, what opening prices will be, etc. 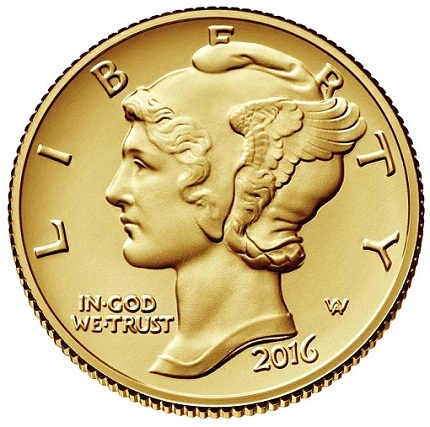 Last month, the Mint announced that the 2016-W gold dime will be released on April 21, 2016, most likely so it coincides with the American Numismatic Association’s National Coin Week, whose theme this year is images of Liberty on American coinage. Then during the March 31 to April 3 Whitman Coin and Collectibles Expo held in Baltimore, Maryland, an example of the coin was on display, including the custom wooden box it will come in. Finally, a couple days later, the Mint announced some of the critical details buyers have been so eager for: the issue will have a maximum mintage of 125,000 coins, and there will be a household ordering limit of 10 coins. In addition, the coins will be a little bit smaller in both thickness and diameter compared to the originals. The 2016 coin will have a thickness of 1.19 millimeters (.047 inch) and a diameter of 16.5 millimeters (.065 inch), while the 1916 coin’s dimensions were respectively 1.35 mm (.053 inch) and 17.9 mm (.705 inch). 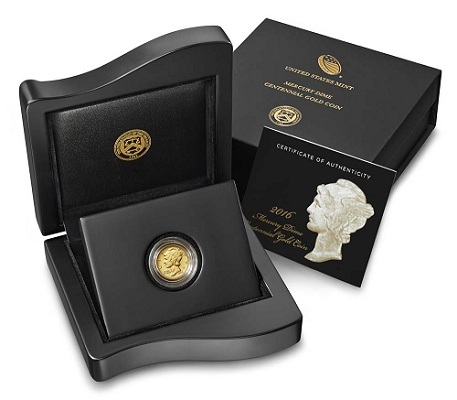 Some collectors have expressed disappointment about these details, arguing that the gold tribute dime is not a faithful replica of the original because of the differences in its dimensions compared to the original silver coins. They are also concerned the mintage and household limits are too high and that the price may turn out to be too high. The opening price will not be set until the day before the release and will depend on gold prices, but based on the price grid published on April 14 in the Federal Register, the price will be $205 if gold remains below $1,250. That makes sense since the cost of a 1/10th-ounce American Gold Eagle Proof coin is currently $175, and the gold dime has extra production costs plus the wooden box. The Mint has also revealed that each planchet, supplied by a company in Massachusetts called Leach Garner, was struck twice on a Graebener press and that each die pair used to strike the gold dimes was only good for an average of about 1,900 coins, which seems likely to have increased production costs since more die pairs than usual were required. In addition, when collectors saw the images the Mint provided, many noticed that some of the details seemed weaker such as in the hair and the wings of the cap on Liberty and that the bands on the fasces on the reverse appear not to be what are known as “full bands” (with distinct and clear lines) on the silver coins. While we await having the coins in hand and to find out why certain steps were taken, such as reducing the diameter, and for clarification on other points, I contacted the U.S. Mint’s Office of Corporate Communications, which provided some very interesting information that answers most of the questions raised by the images and details that were released recently. Question: There is some confusion as to whether the images of the coin that the Mint released is an artist rendering or is of the actual coin. This is important because some people have noticed that in addition to the band issue, there seems to be less detail in the hair and in the wings. If the images are of the actual coin, this may be a strike issue that will vary from coin to coin. Any clarification that can be provided would be helpful. Answer: The images the Mint released are of the actual coin. Question: Many people have noticed from pictures that the coin does not have what are known as “full bands,” which are the horizontal lines on the bands that hold the fasces together on the reverse. Was this done intentionally perhaps for technical reasons related to production, or is it possible that as on the original silver coin, it is an issue that is related to strike, in which case it is possible that different coins will have different degrees of full bands? Answer: No. In 1916, only certain levels of detail were able to be machined into hubs/dies by the Janvier transfer engraving machines. When finer details were required, such as those found in the original Mercury dime, that detail had to be hand scribed into the tooling by artisans of the day. This hand scribing of additional detail in the tooling stage was phased out many years ago. The current digital process enables the Mint to achieve very high levels of detail. However, coin diameter, coupled with the physical limitations of milling steel hubs/dies while trying to achieve fidelity of detail, are all connected. Some limitations in detail achieved are inherent in the process. Question: I read online that the dies received no special polishing, which seems unlikely to me since I thought dies were always polished or at least receive some special preparation, including for business strikes. Is there any truth to that? Answer: Yes. The coin is a business strike; the dies are wire brushed after heat treating, but not polished to produce a contrasting field, as with a Proof coin. Question: Since the coin (and the other centennial gold issues) were first proposed, the plan was to make them the same diameter as the original but thinner because of the intention to make them even weights, in this case 1/10th an ounce. However, the actual coin is about 10% smaller in diameter, i.e., 16.5 millimeters instead of 17.9 as on the original silver dimes. What was the reason for making them smaller than the original? Answer: We used a planchet we had already developed so as not to incur additional costs. 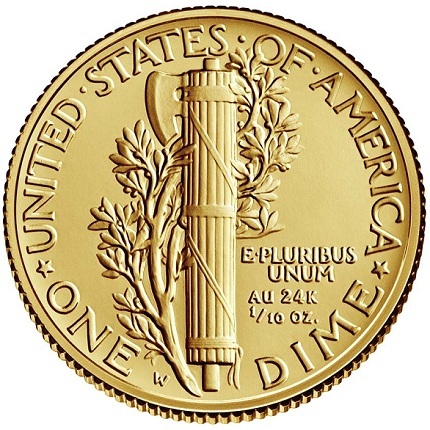 The 2016 Mercury Dime Centennial Gold Coin is struck on a 1/10th-ounce .9999 fine 24-karat gold planchet that is approximately 10% smaller in diameter compared to the 1916 Mercury dime. In an effort to faithfully execute the original 1916 design, the Mercury dime scan data was scaled down to the 1/10th-ounce planchet size. When the tooling subsequently milled, the overall result was softening detail fidelity because the finish cutter diameter could not fit completely into all of the finer detail points found in the 1/10th-ounce-size design. We are currently evaluating the next generation of microscope scanning technology which will enable us to capture accurate detail from coins and dies down to the 1/10th-ounce range. This is emerging, state-of-the-art technology. Future programs should not be limited by current technical scanning limitations. Question: Is the Mint able to say what portion of the maximum mintage of 125,000 coins is already produced? As always buyers are concerned that their orders will not be filled for an extended period. Answer: The Mint anticipates significant customer interest and expects to have sufficient inventory for first-day sales. Many of these coins will undoubtedly be professionally graded, and because the coin is something the Mint has never produced before, several aspects to the grading process are unclear at the moment. One issue that we can probably rule out is possible differences in strike, such as in the detail on the bands on the reverse, in light of the answers from the Mint. Both PCGS and NGC have created attractive labels for these coins. Interestingly, the PCGS label designates the coins as Mint State, while NGC was not yet sure if they will be designated as Mint State or “SP,” which is typically used for numismatic issues that have finishes that are different from regular business strike and Proofs, such as matte finish coins and those struck on burnished planchets. At this point it is simply not clear whether the wire-brushing treatment of the planchets that the Mint described would be something that produces a measurably different finish than regular business-strike coins. Second, it is also possible that prooflike varieties of these coins will be found as well, though that will also not be known until the coins are released and examined. 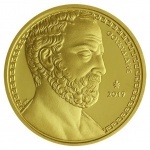 This would be a very exciting possibility given the high premiums that prooflike examples of the 2009 Ultra High Relief and 2015 high relief gold coins, especially in MS-70 PL, have sold for. Another consideration is that unlike Proof coins that are typically found in virtually flawless state and often graded PF-70, it seems likely that MS-70 coins will not be as frequently encountered and could command strong premiums. The information from the Mint clarifies many issues, and provides collectors with interesting details related to the production of the gold dimes. But some aspects remain unclear. Collectors will undoubtedly be eager to see how these various issues play out once the coins are released and are submitted for grading. One other issue raised by the Mint’s information on the gold dimes is whether the technical limitations that were involved in producing the dimes will not be as much of an issue on the other two gold centennial coins since they are larger in size. That could mean the quarter and half dollar will more fully capture all of the details of the original coins, but that too will remain unclear until we learn more about those coins. **When the Citizens Coinage Advisory Committee met in January 2015, which is when U.S. Mint officials first proposed the centennial gold program, there was discussion about whether to issue them in business strike or Proof. The Mint suggested that the former would be better since it would be in keeping with the character of the 1916 coins that were never issued in Proof. While the decision to make them in business strike was not confirmed to those outside the Mint until the first week of April 2016, it always seemed likely based on the CCAC meeting discussions that are covered in the numismatic press. In addition to this, some committee members expressed interest in seeing the coins issued in silver, which would require congressional approval, or in platinum, which would not, but the Mint has never pursued any of those options. As far as mintmarks, the coins had to be produced at the West Point Mint because it is the only U.S. branch mint that stores a large amount of gold and has the security apparatus to protect those holdings. In fact, this mint has the second-largest U.S. gold holdings after Fort Knox. For these reasons numismatic gold coins are almost always produced at West Point. Thank you for a well researched article Louis! Louis, thanks for the informative article. I may pass on the dime and hold out for the other 2 coins. Louis, thank you for your very information article. Yesterday Thursday April 21, 2016 within 45 minutes of their release, all 125,000 of the Gold Dimes quickly sold out. On ebay yesterday Thursday April 21, 2016, two PCGS MS-70 First Strike Gold Dimes sold for $499 each as item #331830554337. A raw 2016-W Gold Dime, ebay item #262398924380 sold for $395 April 21, 2016 @ 10:13 AM.